Prol-Position analyse trends in the movement of call centre jobs around the world as employers seek the lowest labour costs. The following should provide a general overview of the global re-location of call centre jobs. So far most of the (union) initiatives and answers to the question of re-location were constrained to protectionist and/or nationalist campaigns for the ‘defence of our jobs’. We can recall the ‘Pink Elephant’ campaign of the English CWU (Communication Workers’ Union) when British Telecom made an announcement to slash jobs in the UK in order to shift them to India. There are several racist campaigns in the USA calling for abusive behaviour when talking to an Indian or Philippine call centre agent. We don’t criticise the fact that workers fight against redundancies and threats of relocation, like at Wanadoo in France, when the management planned to shift work to Morocco (see article on call centre struggles in France). But it is all together a different thing if unions try to conjure up nationalist sentiments, talk about ‘British quality’ and similar stuff, as part of a populist campaign which didn’t hurt the bosses at all. There have only been a few campaigns where activists tried to break down the national perspective of their unions, e.g. when a US-delegation of unionists visited colleagues in India or campaigns of Spanish and Argentinean activists, when Telefonica tried to play workers off against each other. The rapid development of the call centre relocations means that they also serve as proletarian case studies on how the conditions change in the country of origin and in the destination country, how capital adapts to different situations, and how workers find new ways to struggle as well. As we will see, within a short period capital had to face up to the same basic problems in Indian call centres as it had to in the UK: a high turnover of staff, increasing pressure on wages from below, first (violent) reactions of workers against the undignified working conditions. Capital’s reaction shows its intrinsic limitations, as it further migrates from the big cities to smaller ones, from India to Pakistan and the Philippines, in order to start the same cycle again, but at a higher pace. I made an Indian woman cry and promise to quit her job in 60 seconds. You can do it too! I have inside knowledge of call centres, having worked in several. It’s crucial that the agents be efficient. Barraging them with 60-second calls will ruin their stats and also lower their morale. Eventually, they’ll start thinking ‘another damn rude American a******’ every time a call comes up. All of this will have a cumulative effect. If 100 people across the US would commit to spending 10 minutes a day, we could cripple them, and bring those jobs back to the US. This is only a random (and printable) selection from the thousands of messages in cyberspace calling for a campaign to harass Indian call centre operators, to put an end to the offshoring of jobs. In the last few months, and particularly since the US presidential elections, people working in call centres in the country say that they are receiving more abusive and racist phone calls than ever before. American English Accent. Hello, we specialize in training in American English accents. We are based in San Francisco, USA. Our trainers are licensed speech pathologists with a Master’s Degree or Ph.D. Our trainers will come to your call centre! Over 20 years of experience, with companies and call centres in the Philippines, Korea, and South America. A main destination of outsourcing US-companies is Canada, where the call centre sector was still booming during recent years, unlike in the US or Europe. 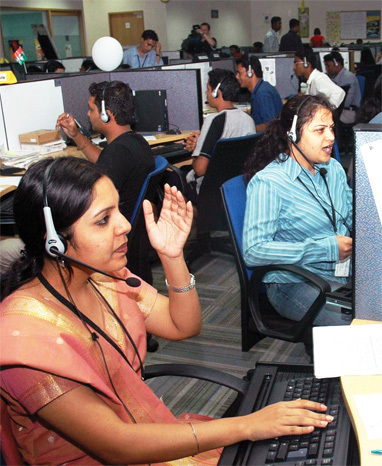 In India the first public criticism of the call centre jobs emerged, declaring that the jobs aren’t steps towards development, but rather an extension of the sweat-shop policies in a different form. It is interesting to see that parallel to the acceleration of capital’s movements the workers’ response also speeds up. For example, the relocation in the car industry from western countries to the new developing countries such as Brazil, South Korea, South Africa didn’t take place much earlier than the 1980s. And it took a while before workers created a wage pressure similar to the one in the countries of origin. With call centres we can see a similar pattern, but due to their very nature there is an acceleration of the whole process. The following news items question the picture of contented and industrious Asian workers who are supposed to happily welcome any old low-waged job from western companies. As a consequence of wage pressure, soaring real estate prices and labour shortages, capital keeps on moving further abroad and/or towards the smaller cities in India. Apart from relocation as an answer to rising wages, we also read more and more about technological experiments in India itself to substitute the work-force with high tech. Indian companies only managed for a very short period of two or three years to establish themselves as low wage alternatives for international capital. The workers’ response quickly crushed this image. As a reaction countries like the Philippines, Pakistan, South Africa enter the agenda. Often cheap explanations are brought up in order to disguise the fact that these countries are only interesting for capital because of the ‘virginity’ and low wages of their workers. The Philippines and partly Pakistan are declared to be more interesting because of the ‘Americanised’ culture and foreign policies. This argument refutes itself, given that jobs are already relocated from Manila towards the countryside, due to lower rent and wages.